Hyphema is the collection of red blood cells in the anterior chamber. A microhyphema occurs when the red blood cells are only detectable microscopically. In a macroscopic hyphema (hyphema), a visible layer of red blood cells in the anterior chamber may be detected even without the aid of slit-lamp magnification. Complications are more frequently related to hyphema than microhyphema. Trauma is the most common cause of hyphema; consequently, hyphema is often seen in younger patients. A blunt, compressive force acting on the globe creates tears in the ciliary body, iris, and other anterior segment structures (see image below). These tears cause shearing of blood vessels, including those that make up the major arterial circle of the anterior segment. Hyphema also may be caused by intraocular tumors, which may be benign or malignant. Layered hyphema from blunt trauma. Neovascularization of the iris or ciliary body may result in hyphema. This neovascularization can be caused by posterior segment ischemia, which usually is associated with microvascular disease in diabetes. Retinal ischemia also can occur subsequently to retinal arterial or venous occlusion. Another cause of the neovascularization is carotid stenosis, which can lead to ocular ischemia. 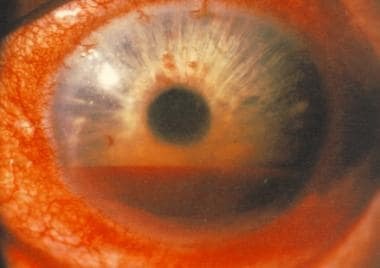 Hyphema also may be iatrogenic in origin; it can occur any time after intraocular surgery, especially surgery that involves the filtration angle. Certain types of anterior chamber intraocular lenses used after cataract extraction lend themselves to hyphema, especially rigid lenses, which is called uveitis-glaucoma-hyphema (UGH) syndrome. Corneal bloodstaining results from blood being forced into corneal endothelial cells, thereby "staining" the otherwise clear cornea. Bloodstaining is an ominous sign and often heralds the need for surgical evacuation of the hyphema. The acute rise in intraocular pressure (IOP) is related to red blood cells and their byproducts clogging the trabecular meshwork; another cause is direct trauma to the meshwork, which occurs concurrently with the initial trauma. Chronic glaucoma following hyphema is partly caused by fibrotic changes in the trabecular meshwork induced by inflammation. Inflammation occurs as a reaction to any kind of ocular damage: cyclodialysis, angle recession, and shearing of the iris blood vessels. Secondary angle-closure glaucoma that results from pupillary block may also occur. Pupillary block is seen when the clot completely secludes the pupil/lens interface, thereby blocking the flow of aqueous from the posterior to the anterior chamber. In North America, the incidence of hyphema is 17-20 cases per 100,000 people per year. The rebleeding rate is 10-20%. Most hyphema cases are due to blunt trauma. Less common causes are systemic diseases and following eye surgery. Spontaneous hyphema is quite rare. Morbidity of disease depends on underlying pathology, associated diseases, and risk factors. The African American population has a higher risk for sickle cell hemoglobinopathy. This group is more likely to have complications of hyphema, including central retinal artery occlusion. The male-to-female ratio is 3:1. The young population is most affected. Approximately 77% are younger than 30 years. The peak incidence is in people aged 10-20 years. Prognosis depends on the size of the hyphema. Patients with a small-sized hyphema have a good prognosis with simple management and treatment. Patients whose eyes undergo rebleeding have a poor prognosis because they have a larger sized hyphema and are also more likely to have higher IOP. Patients who undergo surgery for anterior chamber wash-out or for ocular injury repair following initial trauma also have a poorer prognosis. Total hyphema is difficult to treat, and the visual outcome is usually poor. In some studies, final vision was found better than 20/50 in almost 75% of all hyphema cases. Promote public awareness about wearing goggles in high-risk sports or work environments. For excellent patient education resources, visit eMedicineHealth's Eye and Vision Center. Also, see eMedicineHealth's patient education articles Hyphema (Bleeding in Eye), Glaucoma Overview, Glaucoma FAQs, and Glaucoma Medications. Rahmani B, Jahadi HR. Comparison of tranexamic acid and prednisolone in the treatment of traumatic hyphema. A randomized clinical trial. Ophthalmology. 1999 Feb. 106(2):375-9. [Medline]. Walton W, Von Hagen S, Grigorian R, Zarbin M. Management of traumatic hyphema. Surv Ophthalmol. 2002 Jul-Aug. 47(4):297-334. [Medline]. Hack KM, Pedersen R. Mental status changes and bradycardia: don't forget the eye! Traumatic hyphema can mimic increased intracranial pressure. Clin Pediatr (Phila). 2009 Apr. 48(3):331-3. [Medline]. Campbell D, Shields MB, Liebmann JM. Ghost cell glaucoma. Ritch R, Shields B, Krupin T, eds. The Glaucomas. 1989. Vol 2: 1239-1247. Culom RD Jr, Chang B, eds. Hyphema and microhyphema. The Wills Eye Manual. 1994. 32-6. Drug Facts and Comparisons Staff. Drug Facts and Comparisons. 1999. Gharaibeh A, Savage HI, Scherer RW, Goldberg MF, Lindsley K. Medical interventions for traumatic hyphema. Cochrane Database Syst Rev. 2013 Dec 3. 12:CD005431. [Medline]. Herschler J, Cobo M. Trauma and elevated intraocular pressure. Ritch R, Shields B, Krupin T, eds. The Glaucomas. 1989. Vol 2: 1225-1237. Hersh P, Zagelbaum B, Shingleton B, Kenyon K. Anterior segment trauma. Albert D, Jakobiec F, Azar D, Gragoudas E, eds. Principles and Practice of Ophthalmology. 2nd ed. Philadelphia: WB Saunders; 2000. 5201-5221. Shields MB. Glaucomas associated with intraocular hemorrhage and glaucomas associated with ocular trauma. Textbook of Glaucoma. 1992. 381-399. Shingleton BJ, Hersh PS. Traumatic hyphema. Eye Trauma. 1991. 104-116.